Listen, there's no shame in going to extreme lengths to get your hands on chicken nuggets. They are, after all, the nectar of the fast food gods, and even when they're bad, they're still pretty good. However, if you're in Alabama, the authorities would really, really like you to refrain from eating the ones that spilled off a truck and onto the side of a highway this weekend, per a strongly worded note from the Cherokee County Sheriff's Office. Over the weekend, an 18-wheeler carrying chicken tenders was involved in an accident on Highway 35, scattering its cargo of precious boxed breaded meat chunks across the side of the road. Naturally, like many delicious road spills before, it caught the attention of hungry passersby, some of whom decided it was worth stopping to scoop up the free nugs. Though, uh, as your instincts may have told you, eating chicken nuggets that have been sitting out in the elements for 24 hours isn't exactly safe, as the Facebook post from Cherokee County Sheriff's Office suggests. Following the spill, enough people were pulling over looking for free tenders that the authorities were forced to put out the PSA warning people to stop, not only because they were creating a traffic hazard, but also because, well, they're not safe to eat. Common sense would suggest as much, but hey, the power of free chicken nuggets is real y'all. Apparently, even more people were flocking to the scene after someone posted details of the spill on a local Buy/Sell Facebook page, according to The Takeout. 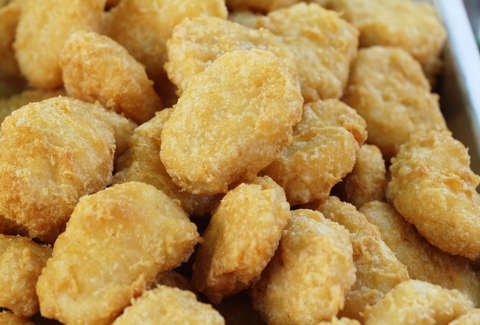 At the moment, it's unclear exactly what brand or variety of nuggets fell off the truck, or just how many boxes have been scooped up, but anyone who gets caught may face charges, according to the Cherokee County Sheriff's post. That's really worth it, especially when you can get 'em piping hot, spicy, and decidedly not from the side of the road at Wendy's for a buck.